Situated in Olveston, a tranquil country village near Thornbury just outside Bristol, Vicarage Farm Beauty and Holistic Therapy Centre is one of South Gloucestershire’s longest established health, beauty and holistic therapy havens, offering exclusive professional skincare, advanced beauty treatments and a fully equipped hair salon. 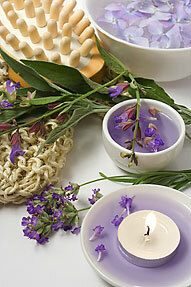 The word holistic means ‘whole’ and holistic therapy refers to the treatment of the individual as a whole. Conventional medicine tends to focus on the symptom or the part of the body that has the problem whilst the holistic approach takes into account the whole person. Holistic therapists believe that the body has a vital life force and when this becomes out of balance - disease takes a hold. The aim of holistic therapy is to restore a balance and help the body heal itself naturally. Holistic therapies do not just have physical benefits - they help the mental, emotional and the spiritual well being of a person. Our professional therapists consider not only the patients symptoms and medical history but also their lifestyle and circumstances and so try to alleviate the root cause of a disease, or imbalance, thereby caring for the whole person, helping them to heal themselves. Vicarage Farm’s holistic approach extends to our effective, highly advanced beauty treatments and specialises in blending tried and trusted traditional therapeutic beauty treatments with contemporary beauty, skin and nail care needs. Only carefully selected, high quality products are used to achieve maximum results by fully-qualified beauty therapists. Our trained, professional skin care therapists are able to provide you with the type of treatment most suitable for you – to deep cleanse, exfoliate, tone, hydrate and nourish your skin. All treatments are suitable for both men and women. Consistent with our core holistic philosophy – Vicarage Farm provides treatments for the “whole” of you; mind, body and spirit – for a complete sensory experience.